dependable and affordable medium-output system. Working with America's leading electrical engineers, Wine Enthusiast has developed a precision digital cooling system for through-the-wall application—the N'FINITY Wine Cellar Cooling Unit. Cools a wine cellar up to 650 cu. ft. The most dependable and affordable medium-output system. Working with America's leading electrical engineers, Wine Enthusiast has developed a precision digital cooling system for through-the-wall application—the N'FINITY Wine Cellar Cooling Unit. Automatically adjusting to ambient temperatures to maintain ideal wine storage conditions, the N'FINITY Cooling Unit does exactly what you want it to do: ensures your wines taste their very best. Engineered to Manage Condensation for Minimal "Sweating"
Size: 15-3/4H" x 14-1/4W" x 17D"
N'FINITY's Longer Warranty: 2 YEARS on parts and labor and 5 YEARS on the compressor. Other cooling systems don't match this length of comprehensive coverage. Cooling area: Cools a wine cellar up to 650 cu. ft.
BEST ANSWER: In my experience it creates an overall more even temp in your cellar if you mount the cooling unit as close to the ceiling as possible. If you rarely access your cellar or have two sets of doors with an air lock between it is less of an issue. I am combing through the cellar 3-4 days per week either editing, adding or (the best) subtracting so I need to add the cool air at the warmest point of the room to avoid a variance in temp. This is all assuming your shelving goes to the ceiling. If it stops at 5' from the floor having the unit above the top shelf of wine by 2.5+ feet should be fine. Hope this helps. My space is roughly 8x8 by 7 ft high. We installed at about five foot level. The instructions which should be accessible on the Infinity website tell you how high to install. The unit has a drain hose which you can affix to either front of unit, or to back (exhaust side). Tip, lots of water comes out when it defrosts, we're using a bucket. We're running at 56 degrees, insulated wine cellar, in a basement that typically runs about 74 degrees. We vent into a storage closet, with no indication of moisture, etc. I'm trying to attach a picture for perspective. Hmm, looks like I can't. I have mine mounted near the ceiling of a 8 foot high room (maybe 5-6 inches between unit and ceiling). However the heat side (outside) has a much higher clearance into the entry way, which has an opening sky window about 2-3 feet above the unit. It works fine. So, in summary, the cellar side is near the ceining but I'd recommend more clearance on nthe outside, vent side. However, a small fan located on that side, always running, should move the heat out into the venting area. I think that should be just fine. Mine is installed at 6', but my room is only 8' in height. My unit vents into a crawl space. Make sure this unit is ok being installed and vent to the outside. Read install instructions prior to buying. I really like this unit. It's quieter and has lasted over two years. I bought a cheaper brand in the past and they all failed inside of two yrs. I cannot give you a complete answer but in making your decision keep in mind that the cooling unit will not cool as efficiently if the exhaust room or outside temperature exceeds 85 degrees. You cannot install this unit on an exterior wall, which we originally wanted to do. Too much variance in temperatures. Note, this unit is rather noisy. Since warm air rises, the higher the better, assuming the room is well insulated. However, for small wine rooms, it probably doesn't matter very much. I have mine mounted about 7' high and it does very well and I have had no issues. My room is probably smaller than yours, but it should work. I installed my unit as high on the wall as possible. About 7.5 ft above floor and it works fine as the cool air settles downward. I own a 3000 and have lost my instruction manual . I need to know how to adjust the temp. You can find a copy of the instruction manual here: http://media.wineenthusiast.com/we/doc/manual/27756.pdf. Will this unit cool down to 55 degrees a 70 square ft room this is 8 ft high ceiling and holds 700 bottles with 4/ 16 gallon oak bbls? BEST ANSWER: My room is smaller (roughly 30 sf) and holds less bottles (200), but in the 4 months since I've owned the unit it's worked quite effectively. In my experience, I've been quite pleased with the performance. Depending on how you have prepared the space with insulation and vapor barrier and amount of glass in the space it should perform as expected. Please review online manual and specification to confirm. My cellar is just slightly smaller, and it's doing well holding at 54-55. (1) how I am going to do the drain ? and how much water is generates in a day or a week?. (2) can the exaust go outside the house through a 6" duck, that is already installed . The N'finity cooling system really should mount 3-6" from the ceiling only. The amount of condensation depends on several factors of the cellar. Please call one of our Wine Cellar Specialists @ 1-800-356-8466 to discuss your situation. i have a 100 sq ft wine closet. will the 3000 be ok? I have the N"Finity 3000 in my small cellar in the basement of my home. In a couple of months it will be two years since I installed. it has worked flawlessly keeping temperature as set. You need to be aware that when it goes on it needs to vented into an open space as you do not want this area to get to warm. In my basement it vents into the laundry room which is always open. The unit is moderately noisy but it should not go on much if the room is well insulated. Also the dimensions you included for your closet are 100 sq feet, do not forget to measure the height of the room as the unit is good for a room up to 650 cubic feet. if your closet has a 6 foot ceiling then you will be at around 600 cubic feet and OK for the unit. When you install make sure you have a place to drain condensation on the venting side, a drain is ideal, if not a bottle that you have to empty every so often will have to do. Make sure your room is well insulated and you will be happy with this unit. Hope this helps and good luck. This unit will work to a max 650 cubic feet. Determine the cubic footage of your room by LxWxH, as long as this falls below the 650 cu ft and there is no windows or glass in the room you should be fine. Also need make sure your room is properly prepared with insulation & vapor barrier seal and the cooling unit is venting in the back into a larger or equal interior space. my unit works fine in an 800 cu ft basement room. If you are 100 sq ft at the base and 8ft height or less, should be fine unless your closet is otherwise exposed to some heat issue . I maintain at 62 degrees for a red one collection. If your ceiling height is 6.5 ft or less, then the unit should be fine. Total volume is the important measure. Your walls and ceiling should be insulated to increase the efficiency of the cooling. Yes, my cellar is around 500 SF and it has no problem maintaining 55F. Do they make a smaller unit? yes mine seems to work just fine. What's the noise level of this unit? and Can the unit be vented to a nearby crawl space? BEST ANSWER: I have no db levels to give. Our wine cellar is in our basement directly below our living room. We do hear sound when the cooler turns on or off, but is quiet to our ears...not much different than when our hot water oil burning furnace is running. As far as venting into crawl space, the installation says the area that it vents to has to be more than the area of the wine cellar. Limiting factors would be the height of your crawl space...not to close to top or bottom, and air temp in crawl space during summer. The unit can only keep wine cellar 30 deg less than this temperature. We (especially my wife) were disappointed by the noise; ours is installed to vent outside, but the noise is very noticeable in five or six rooms, some two rooms away. When this one wears out, we are going to look for something more quiet. 63 decibels. It will need to vent into an interior adjacent space at least 650 cuft. The room venting into should also be less than 85 degrees. The noise level of this unit is "less" or more quiet than my last unit. Yes, we vent our unit into our crawl space, nd run a pipe directly outside our home's structure. I see some answers to the mounting height that indicate the unit should be mounted 6" from the ceiling. The manual says the unit can be mounted as close as 1.5 inches from the ceiling. I'd like to mount it as close as 2" from the ceiling - will mounting the unit that close to the ceiling cause any issues? BEST ANSWER: I think the unit would probably function best if it is 6" from the ceiling. We ended up with a construction miscalculation (additional insulation) and our unit ended up about an inch from the ceiling. It has been in use for over a year and appears to be functioning well, keeping our wine seller at the proper temperature without any difficulties. If you would like to mount it that close to the ceiling ,you can ,and you would use the metallic strip to cover the top vent and that will force the air out the front. If you would like to discuss this further please feel free to call us at 1-800-356-8466 . It should work no problem. Mine is a hair over 2". There is a metal collar that goes around the system which is about 1.5" wide so you need room for it. I am mounted 15" from ceiling. I have no experience with 2" away, but I don't see any issues. We have our unit mounted about 2 1/2" from the ceiling and have had no issues. Can the Infinity 4200 be installed so that it is mounted on an exterior wall and venting through the exterior wall to the outside? BEST ANSWER: I would not think so, at least not in our climate where we have four seasons. Its an excellent unit, does its job and no maintenance issues after 2 years but you would have to check with manufacturer. There are units designed for exterior walls but I'm not sure about this one. This unit is not meant to vent to the outside. We do have units available that are meant to vent to the outside however the Nfinity is not. The temperature delta is 30 degrees so if it gets above 85 degrees the unit wont cool properly and it cannot be exposed to the elements. Hey I have the unit. InwouldnS I the manufacturer. My gut tells me no beacause it would be exposed to elements. I would not do it. I have this unit. If you read the installation instructions l seem to remember it specially says not to vent to exterior. . Does know the decibel reading on the 3000? BEST ANSWER: Fran, I do not have a decibel meter. The unit is fairly loud inside the wine cellar, but barely sounds at all outside the well-sealed door to our cellar. I can only hear it (barely) for maybe ten feet outside the door. Our wine cellar is next to our basement theater, and it doesn't bother us at all. No - and it is on another floor in a closed wine room so I never hear it. My impression is that it is reasonably quiet but I do not spend an inordinate amount of time in the wine cellar.. I do not know the answer to this question. I have my unit in the lower level of my house and I do not hear it on the second level. This unit runs on average at 61 decibels. I have 3000 unit with drain ports front and back and I am utilizing the back drain port. I have never seen any water in the tubing nor the bucket. Yesterday water was dripping from the capped front drain port and when I removed the cap I got about 16 oz of water. I am worried that something is wrong with the design. I have blown through the tube in the back and seems like no restrictions. Has anyone experienced this problem? The unit is about 6 months old. get. Can we follow up on this issue? Yes let's follow up on this. I plan to call tech service on Monday. Larry , I removed the unit and found a lot of water in the unit. I re-Installed the unit with a 3/8" pitch to the rear. After two cycles of the unit it started to drain out the rear port. I had the same problem with my 3000 cooler. I had the tube hooked up with the rear drain but never got any water coming out of it. When I unscrewed the front drain cap I got some backed up water out of it. Now I'm just using the front drain. I also have never had any water out of either port. (It is set up to drain out of the rear port). Is this a systemic defect in these units? Ps: I will check mine as soon as I get home. This happen to us with our first machine. When it very warm out it sometimes does that. We haven't experience it with the new machine. BEST ANSWER: The Infinity 3000 works well in our 600sf wine room. The room is in the basement, and while the outside ambient temperature where we live often reaches 90 degrees, the basement rarely gets above 70 degrees. The unit does a great job keeping the wine room at a consistent 55 degrees year round. We are extremely happy with the unit. If you have central air, the outside temperature, probably is not that important to your decision. Hope this helps. The answer is how good you insulated the walls. Well insulated iit will be fine. If. Not well insulated you can have other problems. do these units have fuses? BEST ANSWER: I don't think they do, I plugged it into a circuit protected plug and it has been fine... As a matter of fact ,Impressive!!! They do not have fuses. Where is the drain located on the N'Finity 3000 unit? BEST ANSWER: This unit has 2 drain lines. 1 under the unit towards the front and the other is in the back. If using the one out the back plug the one in the front with the supplied plug. The drain port is located on the rear bottom corner. How many AMPS does this require to run sufficiently? BEST ANSWER: It is suggested that you have a 20 amp dedicated circuit for this unit. This unit has 30 starting amps and 5 running amps. Can the unit be installed through a double wall that is 12" thick? BEST ANSWER: The N'FINITY 3000 Wine Cellar Cooling Unit measures 17" deep, so it is deep enough to be installed in a 12" wall. However, strongly recommends consulting a Wine Storage Professional prior to installation to make sure you install the unit in the best wall and location for your room. Thank you for your inquiry. With a wall that thick, this unit may not be the best unit for that application. Please call in and speak to one of our consultants at 800 356 8466 so we can better assist in the install. Thank you again. How much heat does this unit generate to the venting room? For example, if it is venting to an exhaust environment that maintains between 70 - 78 degrees, how much heat will it generate into that room? There are many factors that may affect this. The room that it is venting into needs to be at least same size as the cooling capacity of the unit. For the most part, the air coming off the back is approximately 85 degrees. Please give one of our Wine Cellar Specialists a call @ 1-800-356-8466 to further discuss. The heat vented is determined by the workload put on the machine by the room it is cooling. Typical ventilation systems should be able to overcome the heat generated. Does this product come in a 220V version? 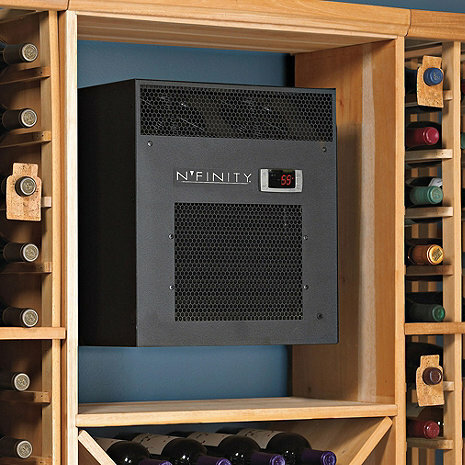 BEST ANSWER: The N'FINITY 3000 Wine Cellar Cooling Unit is not offered in a 220 volt model. If you contact N'FINITY customer service at (800) 377-3330 they provide a free consultation with a wine storage specalist. Thank you for your question. Unfortunately this does not come in a 220 V version. If you have further questions please call us at 1-800-356-8466. In the picture it shows the power cord coming from the back ... is there an option to have the power cord come out of the front? BEST ANSWER: Thank you for your question. Yes please give us a call at 1-800-377-3330 and we can order this unit with the cord coming from the front. Yes, the online manual says the front location of the power cord is optional. Hi. I am finishing up my cellar and need a cooling unit. This unit looks good except I see there are several reviews complaining that it does not keep the cellar at a very stable temperature - some say up to 6 degree variation! Is that really the case with this unit. I am expecting stability within 1-2 degrees not 6. Please let me know the spec on this one in that regard. thanks! BEST ANSWER: This unit is designed to maintain a stable temperature and automatically adjust to ambient temperatures outside the room with a plus or minus 30 degree differential (this means the temperature outside the wine cellar environment can differ by up to 30 degrees of the temperature the unit is set for - if set to 55, the outside should not exceed 85 degrees). You should also keep in mind that you should not use this in an area larger than the recommended square footage of 650 sq. feet. Also, N'FINITY offers a warranty of 2 years on parts and labor and 5 years on the compressor. which exceeds the length of most other manufacturers' warranties. You may also want to discuss this concern with one of Wine Enthusiast's storage consultants. There are many variables that could affect a large temperature differential like this. May I suggest that you call and consult a storage specialist to discuss your wine cellar specifically. This unit has performed extremely well in the field. The manual mentions the use of "pan tabs" containing quaternary ammonium chloride. The pan seems to get quite nasty between cleanings so I was thinking of finding some. Interestingly, WE does not list nor does any other wine cellar site. I found some on Amazon but the tablet makes 1 gal (that'd be a LOT of condensate). Does anyone use drain tabs? If so, where do you purchase them? Any advice would be helpful. Thanks. I would like to buy a wine cooling unit . Can you ship to Australia? I have a kw 800b when I plugged it in after a minute or so it made a single click and the condensor came on but the fan never came on. What could be the problem? BEST ANSWER: Please reach out to our tech support team at 1-800-648-6058. Hello, i have a 335 Cubic Feet room, what is te difference between WhisperKOOL Slimline 2500 and N'FINITY 3000. Any advice? Hope all is well. Please give one of our Wine Cellar Specialists a call @ 1-800-356-8466 so we can identify the best cooling system for your application. HI, I live in Malaysia and i am interested to purchase this I would like to know the HS CODE to find out the import duty, also does your $100 shipping cost include shipping to Malaysia ? BEST ANSWER: We would have to get a shipping quote to Malaysia as the 100.00 cost is to the 48 continuous US states. I have a model KW-4200b that recently died after 7 years. Do you still make this model? If not, what would replace it? What is todays cost? Yes, we offer both the Whisperkool SC 4000i or the Nfinity 4200 as a replacement. Feel free to call one of our Wine Cellar Specialists to discuss @ 1-800-356-8466. We need to maintain higher humidity than outside air here in Wyoming. Would this unit provide any humidificaton? BEST ANSWER: These cooling units do not dry out the air like an airconditioner but if you are in a very dry climate like Arizona,Nevada, Colorado etc... you will need to purchase a unit that has the capability to add humidity which this unit does not. I have an older KW-4200b; which still works well. However, I occasionally get error code "df" on the display, but don't know what it means. BEST ANSWER: Regarding the error code, it would be best to call in and speak to our technical department at 800 648 6058 option 2. I live in colorado where the humidity is very low. Will this unit control/add humidity into the room? While this system will help maintain humidity it will not control or add it. Please feel free to contact one of our Wine Cellar Specialists @ 1-800-356-8466 to discuss all available cooling system options for your specific needs. Will the 4200 fit in a hole left by a WhisperKool XLT 4200 that I am replacing (appears to be the same size unit)? BEST ANSWER: Yes the Nfinity will fit the same space. It looks like the evaporator coil in front has gone bad. Where can I order a replacement or is it under warranty? The unit is just over 2 years old. BEST ANSWER: This unit has a 2 yr parts and labor and 5 yr compressor warranty. Please give us a call at 1-800-356-8466. This is my 3rd cooling unit for my cellar. The two previous where Grand Cru's. The 1st lasted 5 yrs, the 2nd only 4 yrs. This unit is much quieter, less vibration and appears sturdier than the other Grand Cru's. It's installed in my basement, my living room is directly above and we can not hear it operate. The Grand Cru we had before (4200) was poor in every way, would never buy again. So far so good with this N'Finity, just hope it lasts longer. Delivery was faster than promised and in perfect condition. The unit worked fine for the first 3 years, but now won't cool. Likely a compressor issue. Wine Enthusiast wouldn't stand behind the 5-year warranty. Time to try another brand from a different website. The documentation was available online so that our contractor could start prior to the unit arriving to build the vapor barrier and other requirements that are crucial to a successful wine cellar. The unit cannot vent outside so we vent it into a hallway - it is a little loud for this but ok. It is working great at keeping our treasured wine in perfect condition! runs quiet. Temperature does fluctuate 5-6 degrees. Everything was as advertised. Other reviews complaining of noise are unfounded. Works great and noise is not an issue. Customer service and follow-up call after placing order to make sure the product would meet my needs were great and beyond my expectations. Arrived on time as directed. No issues. Unit arrived as notified and in great condition. Service was excellent with emails ahead of delivery explaining unit precautions prior to use. As a architect I've done several winners, and this unit is the noisiest cooler I've ever heard ---- looking for replacements now! Pulled out my old unit and this one fit right back in - no problem. Took maybe 20 minutes to install. For a wall unit, this runs super quiet - can't even tell when it's running. Installed this unit to replace failed cooler by another manufacturer. Very easy installation. Unit does not appear to be running hard at all. Temp set at 57 and room stays between 57 and 59: very constant. Excellent cooling unit for small cellars. Easy installation and operation. I think it will be fine. However, at this time I am unable to adjust the temperature settings. I have a call in to Wine Enthusiast now. I've owned the N'FINITY 3000 Wine Cooler now for about 2 months. It's cooling the room nicely, as expected. It makes more noise than I expected. I bought a new N'finity 3000 unit because the old one failed. It required service after 3.5 years and failed at 5 years. I bought another one because it was the right size. I hope it performs better. I used this unit to convert a closet to a wine room, unfortunately it's right below my Bedroom (it vents into the garage which my bedroom is over) and it's way too noisy. I can hear it cycle on and off and it often will wake me up. I put this unit on it's own electrical circuit. It comes with two drains, front and rear. You only need to connect one.